Christmas was a big thing for Facebook with Christmas wishes being sent, Christmas photos being uploaded and Christmas applications being installed. Usernames like 'Santa Claus' and 'Father Christmas' were barred, but Christmas applications were varied and popular. 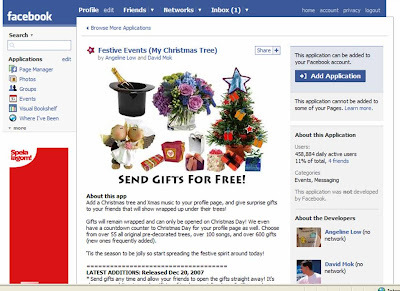 When I looked there were 179 different Facebook 'Christmas' applications and the most popular seemed to be 'countdown to Christmas' or 'wish someone Happy Christmas' applications. 2007 has seen YouTube become established as a true broadcast medium. 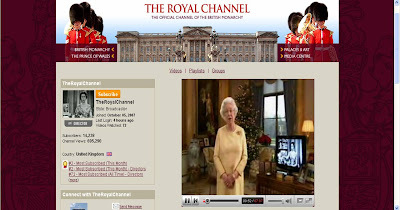 The best evidence of its use as a professional medium was the Queen using it to distribute her 50th Christmas message. OfficeMax developed a website called 'elfyourself.com'. Users could upload up to 4 pictures and these would be used as the faces for up to 4 dancing elves. Users could then save their creation and email it to friends. This has been used all over the world and I am intrigued to see the final figures after elfing stops on 2/1/08 - a brilliant example of viral promotion. For the last 50 years or so the strategic air defence systems at NORAD have tracked Santa, however this year they used Google platforms to enhance things. NORAD used Google Maps to track several hundred of Santa's stops in over 200 countries and posted video footage of each stop to YouTube and GoogleMaps. 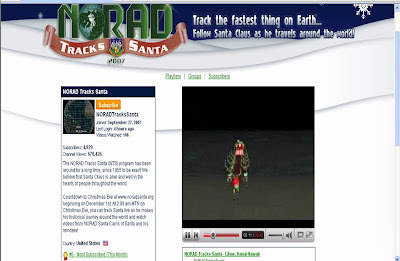 NORAD also offered a downloadable Santa Tracker file for GoogleEarth. Nice way of using new technology to enhance a longstanding Christmas tradition. It wasn't just Facebook applications this Christmas - there were a plethora of widgets that could be used on Myspace or blogs or other websites. The most popular Christmas widgets seemed to be Christmas tree countdowns to Christmas Day. The popularity of using widgets to enhance content has been growing and the widespread use of Christmas widgets has further increased widget penetration. At the end of a significant year for the development of the web (social networks, user generated content, web 2.0 etc), Christmas 2007 was always going to see some interesting online developments and the five examples above are good illustrations of how the web can now be used.